I have more bins full of Halloween goodies than any other holiday. Several bins of Halloween costumes accompany more bins of decor and these seem to multiply every year. Because you have to make original Halloween decorations each year right? Yes! Here’s a collection of DIY Halloween Spider Decor to spark some creative inspiration for the upcoming spooky season. 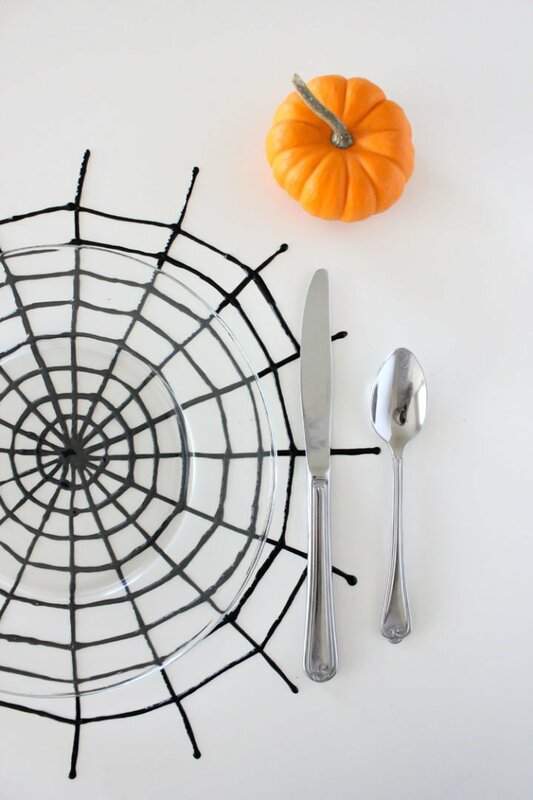 These spiderweb placemats by Delia Creates are so much fun for a Halloween tablescape. Made with black puff paint on wax paper, Delia mentions that they’re very fragile and could be used as window clings…hmmm the ideas! Another Delia Creates DIY Halloween spider decor project, this spiderweb doormat is made by reshaping a half circle doormat and adding fabric paint. So easy and effective! These are some of the most authentic looking yarn spiderwebs I have ever seen. The Crafty Lumberjacks used up some wall space to create these very cool Halloween decorations. Created by Life Prekarious and shared on Over The Big Moon, this hula hoop spiderweb makes an awesome Halloween wall hanging. Made with a little yarn and a hula hoop, just add spider. Another spin on the yarn spiderweb, DIY + FYI filled a window with a spiderweb and creepy crawling spider. An easy DIY Halloween Wreath made with just a few materials. 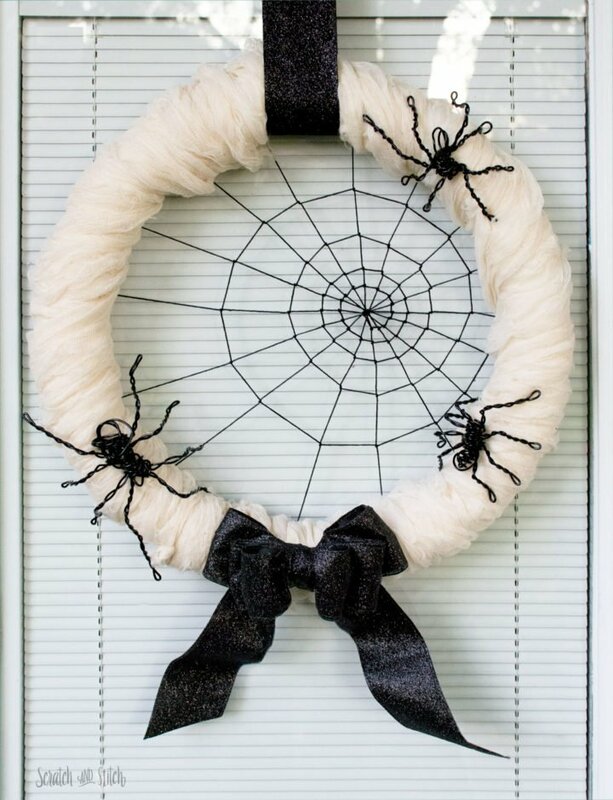 The black and white wreath is wrapped with cheesecloth, spiraled with a spiderweb, has wire spiders attached, and a black glitter bow. 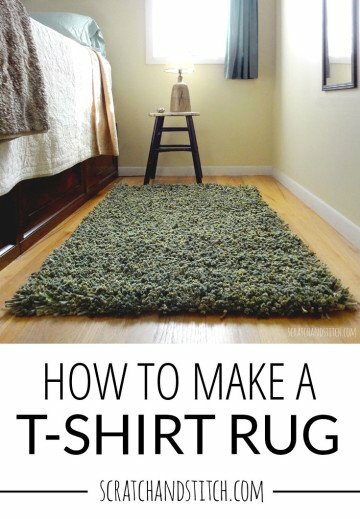 Make this project in under an hour! A quick and disposable DIY Halloween spider decoration idea on HGTV. This folded snowflake style concept could be applied to fabric, paper, or plastic. Hanging tattered and torn cheesecloth on anything and everything is a must for my outdoor Halloween decor. It’s so easy to make look creepy and the more haphazard, the better. My Untangled Life created a giant outdoor spiderweb for their front porch Halloween decor complete with giant creepy spider. I’m in love with this idea. Really anything spray painted is a win in my book! Eclectically Vintage got it just right and the outcome is perfect with the use of chalkboard paint. Over-the-top Halloween decorations are the way to do it! And this kind of gives me the heebie-jeebies (i.e. it’s perfect!). This is such a simple Halloween DIY idea that could be applied to many things. I’m thinking a stencil for a fabric painted t-shirt or tablecloth, pages in a scrapbook, or a Halloween pillow. Another house covered in Halloween decorations FTW! These oversized cobwebs that cover this Victorian house are fantastic and the look is so easy to achieve. When I find spider eggs in our home I’m pretty disgusted. Just the thought of hundreds of tiny baby spiders sprawling throughout a room makes me shutter. That’s why these DIY cobweb clusters on HGTV are the perfect creepy DIY Halloween spider decor. When you have a large grand entrance to your home, you adorn it with an equally grand display during the holidays. Katie from Bower Power made this large spiderweb doormat and Webster the spider to accompany it. Another oversized yarn spiderweb made for outdoor Halloween decorations. I like the use of white yarn and how it’s spread on a corner of the front porch. 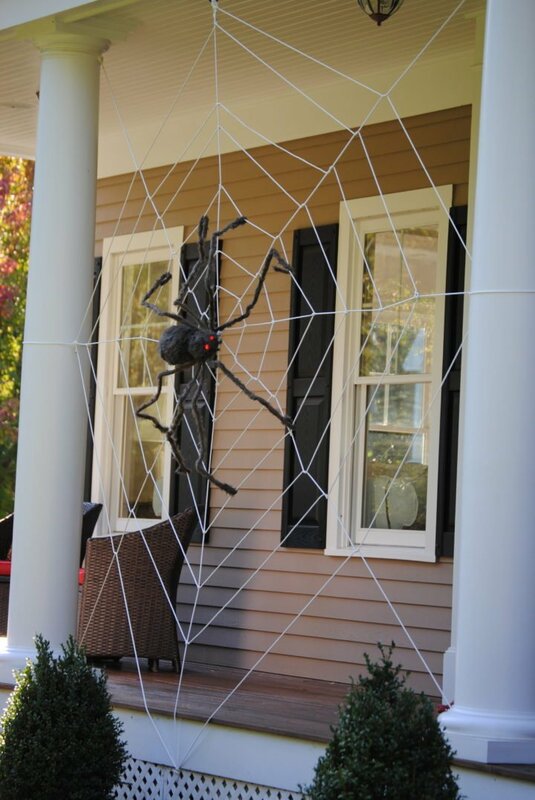 Laura from The Experimental Home did a wonderful job executing this DIY Halloween spider decor. This Halloween wreath is the perfect way to put some torn up fishnets to good use! Just slide the tights onto the pool noodle, form the noodle into a ring, and add accessories. I’ve always been impressed with hoop art but have never gotten into it myself. Seeing how cool this DIY Halloween spider hoop art makes me want to give it a try! Flamingo Toes shares her free pattern along with a great tutorial to follow along with. What a great spin on the classic paper ring garland. Doodle and Jots created a video tutorial to follow along with to create her creepy spider garland. It was time to upcycle an old clock at Just A Girl‘s house. Chris disassembled the clock parts, painted over the existing pattern, created spiderwebs to stick on, and attached spiders in place of the numbers. It’s houses like this that keep me expanding my Halloween decoration collection. Because one day I’ll be able to have an over-the-top display like this house covered in cobwebs and creepy creatures. 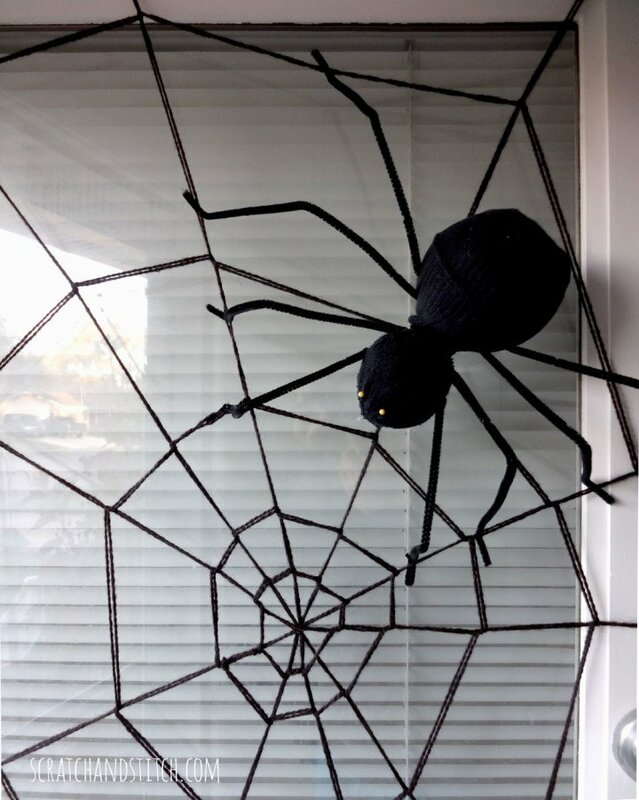 Many of these DIY Halloween Spider Decor projects can be made in an afternoon! Which one are you going to try?